Behold....a square of cloth with Sonic on it! Just what we needed. Here are 5 boxes of...things. What are these? Bendys? PVC Mini-figures? Whatever they are, we have some rare gems in here! All sorts of great game robots or badniks! Chop-Chop the fish, Crabmeat the Crab, that flying thing that was purple, Roller, Caterkiller, the Pig who did bombs in Sonic 1. 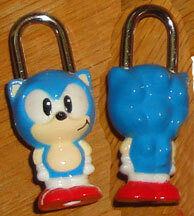 Even Eggman/Robotnik and...Metal Sonic! What a set! The Sonic and Tails sculpts aren't that great, but the robots are spot on! I mean, this has to be the ONLY Bombin' Pig action figure you'll see today. Some little PVCs would not be all that remarkable...except that there are 3 unique Chao in here. A normal Chao, a Nights-type flying Chao and a little Sonic Running Chao with bunny ears! Everyone would LOVE these, why don't they release them? Are they toys, display figures or something else? This photo is very small & old, it's too bad there's not a better one to see the fun different chaos closer-up. Here are some bonus items for the release of Sonic Boom Fire & Ice, but only in Japan. But...why aren't these on the "Boom Gear" page? Because they've got nothing at all to do with Boom. They're all normal classic style items. 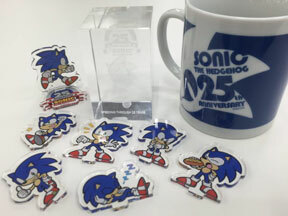 There are acrylic mini Sonic arts which snap into a stand up base (see the little pegs on the bottoms), another crystal cube & a 25th Anniversary mug. Why release classic stuff with a Boom game? It's the only new game coming out during this, the 25th Anniversary year. The stuff is actually really super! The mug has great design, the crystal cube is 3D and the acrylic pieces bring cute & fresh new art! As a bonus-item-only all the items are likely to be rare, & the good design will ensure it's all desireable. Remember the set of tiny locks seen way back on Japan Random 1? These may or may not be an actual lock from that collection. 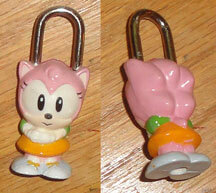 Yes, it's still a padlock, but it is figural instead of a flat enamel (as those appeared to be) Little Amy looks classic and cute here in her Sonic CD outfit. Chibi-style Eggman is (surprisingly) giving a thumbs-up with 1 hand behind his back. Little Sonic has a super round head, & mini Tails looks excited while also doing the thumbs up. 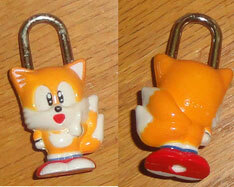 Look how well they sculpted his tails. 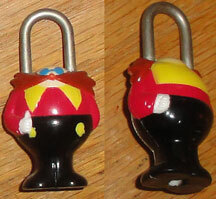 The keyhole is in the character's shoe, though the key is missing for all. This is a very fun & cute collection of small locks. This item was labeled 'a sticker', but what's it for? How big is it? It was likely a booth prize of some sort, as it is from the Tokyo Game Show in 2016. What's interesting about it, is that if it's from 2016, why is it really-really trying to be classic looking & not Mania-like? 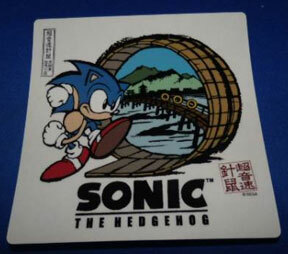 It has 'getting ready to run' Sonic standing before a wooden loop that goes into a bridge over water in the background. 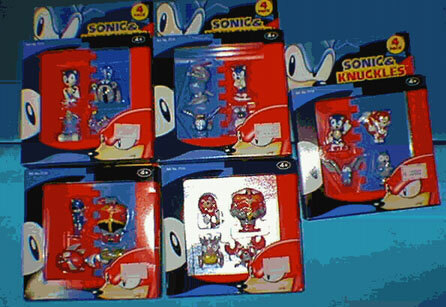 This is called the "Sega Freaks Cards Set"...but other than 'cards' what exactly is it? The art here is nice and varied, some of it appears to be from the "Sonic Screen Saver" that was sold in Japan for a while. The backs of the cards all also have a smaller picture of something (not the same as what's on the front) as well as a larger word, & a bunch of text.